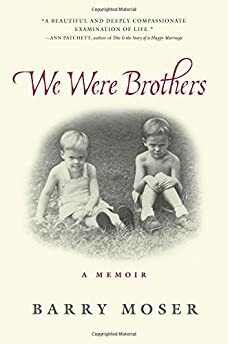 Largehearted Boy: Book Notes - Barry Moser "We Were Brothers"
Book Notes - Barry Moser "We Were Brothers"
Barry Moser's We Were Brothers is a heartfelt and vividly told memoir of sibling love, division, and forgiveness. "This boyhood memoir reveals much more than it ever explicitly states, with its tight focus on boyhood, brotherhood, estrangement, and reconciliation . . . With a prose style that is precise, understated, and that rarely veers toward sentimentality, Moser describes coming of age in Chattanooga in an era permeated by racism and where any sign of oddness or weakness encouraged bullying . . . With masterful narrative control, Moser reveals the narrowness of perspective as well as the limitations of memory." Someone once said that "If it weren't for music, I'd be an atheist." I wish I had said that. I fell in love with music when I was a small child living in a small house on a narrow, dusty road at the eastern foot of Missionary Ridge in Chattanooga, Tennessee. It was the 1940s. Music was the only form of art in that house, and it came in all forms and varieties. Music was the one thing that my brother Tommy and I both loved. I don't believe we ever fought when music was playing, and not fighting was a rare thing for us. I think I was weaned on George Gershwin's "Rhapsody in Blue." Our recording was by Andre Kostelantez and his orchestra with Alec Templeton playing the piano. I can still see the cover of the album—a white piano beneath a street lamp with a silhouetted skyline in the distance. Tommy loved this music so much he fantasized that one day he would become a pianist himself. He certainly had the long hands for it. We had several recordings by Enrico Caruso: "O Sole Mio"; "Vesti La Giubba"; "Celeste Aida." We also had recordings by John Charles Thomas and our fellow Chattanoogan, Grace Moore. I fantasized that one day I would be the next Caruso—or maybe the next Mario Lanza. When I was big enough to push a chair over to the big Victrola console and put those big, ceramic records on the turntable all by myself I fell deeply in love with Chopin's Polonaises, especially the Military and the C minor—big music for a small boy. I listened to them so much, especially on rainy days, that they left an indelible mark on my heart and my soul. They move me to tears to this day. But when I close my eyes and think back to that distant time, when my brother and I would lie on the living room floor drawing air battles, we loved to listen to Fats Waller singing "Ain't Misbehavin'," or Cab Calloway singing "Minnie the Moocher." I'm ashamed to admit that other than my mother's closest friend, Verneta Gholston, these performers were the only black people my family had any use for. And at that, only when they felt that those performers "knew their places" and didn't have the gall to think that they were as good as we were. My favorites were the Ink Spots. Wonderful songs, those: "If I Didn't Care," and "I Don't Want to Set the World on Fire." I hardly ever make coffee in the morning without the words from Java Jive coming to mind: "I love coffee/I love tea./I love the java java/and it loves me…" Or my favorite, "I'd Climb the Highest Mountain": "I'd climb the highest mountain, if I knew that when I climbed that mountain, I'd find you.…." I played that song over and over, year after year, lying on Mother's Karastan carpet, staring at the ceiling and dreaming about climbing high, high mountains, or swimming deep, deep rivers, to find the woman I would one day meet and love as much as I loved music. It seems tragic to me that given our mutual love of music, and such a wide variety of it at that, that it did not forge a bond between me and my brother. But it did not. When I think back on that time, I wonder sometimes if our appreciation of that same music could been a way of bringing Tommy to see black people in a more equanimous way. And yet, we never discussed it. But perhaps music did eventually make its way into our lives and healed the old wounds. Not the music from the keyboard or the vocal chords, but with music that comes when the conflict between consonance and dissonance reconciles and harmony ultimately prevails. Before Tom Moser died we had managed to discuss so many of our differences and to confront our very opposed attitudes toward race. I could not change Tommy, but I like to think that he finally understood how I felt, and our nettled brotherhood had finally achieved a brotherly concord. I am quite sure that when he went on ahead, he went with peace in his heart. I know for certain that the brother he left behind lives on with peace in his.